Heat butter in a pressure pan or cooker, add cumin seed, cloves, cardamom, bay leaves , onion,g.chilles & sauté few mins. Add ginger garlic paste and all vegetables, basmati rice, salt & water. Allow to cook 1 or 2 whistle . Garnish with cashew nuts & Serve hot with any raiths. welcome back dear... lovely pulao.. nice to see u back.. was missing ur recipes all these days.. how was the trip? woo this looks awesome...can have it any time..
Was wondering were u went!! Looks colourful dear! pulao looks yumm..long time..no see?? Pulao looks so colourful and delicous. glad to ceeu back,.hope u dng fine,...?/? I have something for u in my blog.. Pls check..
How could one not be attracted so such an attractive plate of food. Wow nice to c u after long time, yummy pulao. 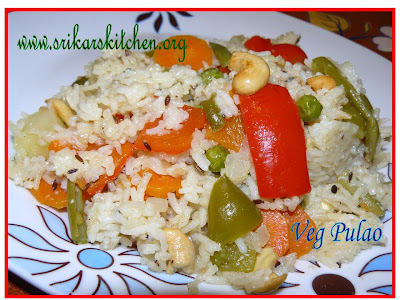 Nice to c you back sripriya:)Veg pulao looks colourful& yummy. hello dear.....where did u go?...a month gap....missed your lovely recipes..yummy pulao..
Who doesn't love some veggie rice??? Looks tasty! WOW! Colorful and yummy fried rice..nice recipe..following you..